Remembering conversations with the first boss I had when I migrated in the U.S. back in 2007. He narrated how he claimed his dreams on becoming the General Manager of the BEST resort in the world. He didn’t finish high school nor was he part of any Ivy league University but with perseverance, no diva attitude and willingness to learn, he wanted me to put into heart and cherish every challenge, fail forward, calculate risks yet not to be afraid to try, be truthful of your limitations and hone your strengths. I never really understood these words not until I’ve reached this age wherein I myself couldn’t even tell what I wanted and skills did I really want to hone . I still believe nobody really knows what one wants to do but one would have an idea what it is. As a gal fresh out from college (I missed the commencement exercise) He read my essay and felt the height of my ambitions. Up until this day, I still can’t believe I had an upgrade from what I’ve prayed for. He started as a bartender, experienced different rank-and-file positions before he became a General Manager. 8 years after, with the help of LinkedIN, I found out he finally took the step he’d always wanted to take off from his bucket list – he’s currently taking an Associate degree making his practice as a hotelier even more legit through earning a degree and get to learn the dynamics furthermore. Finally, he built his own global hospitality management consultancy. I have my colleagues to thank for their patience, too. He told me the importance of knowing -if not all– most of what the people do in operations. Yes, I juggled and went beyond my job description. I experienced being a reservationist, guest relations, kitchen helper, server, concierge, babysitter, Chef, housekeeper, and even cleaned the loo. I can now really say, he taught me well. He developed my curiosity and made me understand what I thought will never be useful. He was right when he told me, it is only when you try, you’ll be able to know. Along the way, through knowing my weaknesses and sharpening my skill sets, this is where I finally inject pursuing further education. I know I’ve always had the hunch on wanting to serve people, do marketing strategies and be part of the branding shebang but didn’t know how to proceed. He advised for me to explore the world, try other things and earn the experience. If I finally get to convince myself that that is what I wanted – come back with the valuable experiences. It is through him when I found out about Cornell University​ and the thought has never left since. He specifically said something like “One day, when you get to chance to, you’d have to experience the ‘Harvard’ of Hoteliers” Indeed, it has now materialized. A scholarship I never really thought would -re-represent in itself. Following his footsteps, I hope one day, we’d bump into each other. I would want to thank him for those passed on words of wisdom. Education may not be a huge factor in achieving your dreams but it can be the key, or tool to get you there notably. I’d be stunned if I find out he’d be one of my virtual classmates. I have been away from the Hospitality Industry but this time, I’m going back to my roots. 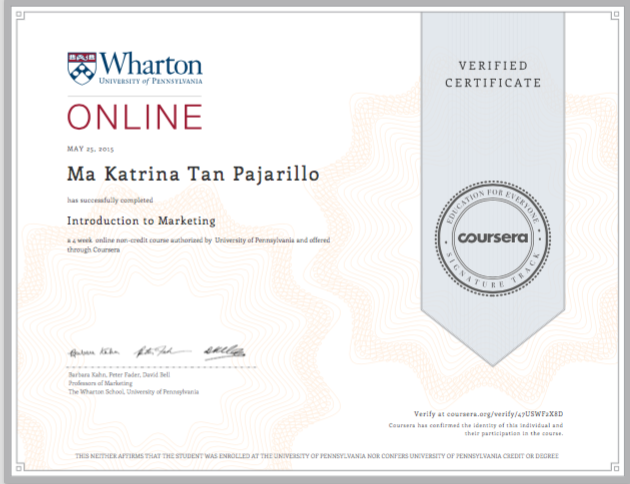 Claimed my first online educational completion certificate from Wharton School of the University of Pennsylvania, Wharton Introduction to Marketing on Coursera​, I know, for the next steps, I’m ready. I begin with my eCornell course on the 11th of June 2015 focusing on Hospitality Marketing.